Shepparton's Annual Board Game Convention! Posters & Pages & Guilds o my! We have been busy over the last few weeks getting everything under way to make sure ShepparCon 2017 is as fantastic as we can make it! We have also set up a ShepparCon Facebook Page! Help spread the word and give us that big blue thumbs up! 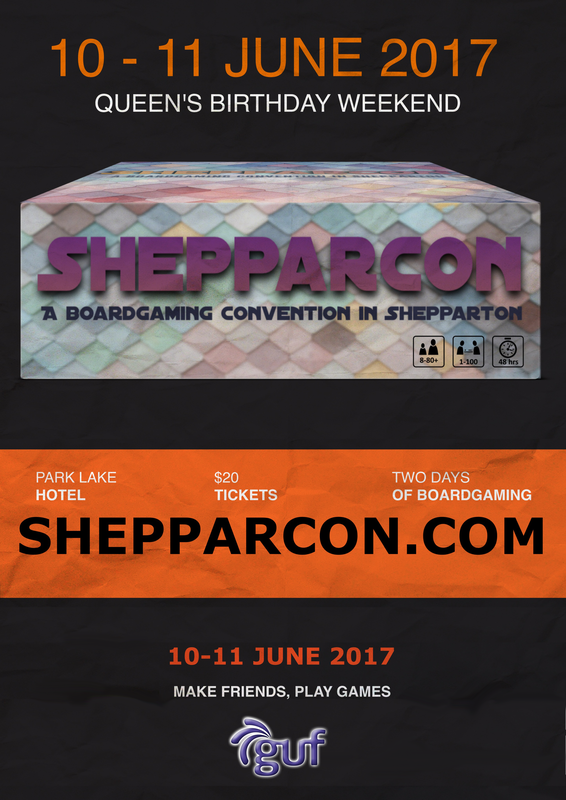 We will shortly create an official event for ShepparCon 2017 for everyone to jump on board! Lastly, we have a shiny new logo and flyer to welcome the coming of ShepparCon 2017!! A big thank you to everyone involved in putting them together, they came up great. Be on the lookout for it around town or at your nearest board game convention! ← Games Games and More Games! Looking for more gaming as you wait for the next ShepparCon? Look no further than the Goulburn Valley Gamers Guild fortnightly board game events held in Shepparton!